This entry was posted in computer, organization, productivity, theft and tagged 2Do, Action List, Apple, BlackBerry, curling, David Allen, DayTimer, Getting Things Done, GTD, iPod, Mac, MacBook, Microsoft, Next Action, OmniFocus, OneNote, planner, productivity, Toodledo by yarnologist. Bookmark the permalink. in terms of all this technology and it’s organization – sorry, can’t help you. As far as I can determine you are light years ahead of me… I do, however, have a full-proof, rob-proof, technology-crashing-proof system. I write stuff on paper. Ah, but how do I keep track of the paper? THAT’s the problem. I used to be a die-hard paper advocate, but so much of my life is spent on technology now it’s getting harder and harder for me to keep track of a piece of paper for more than 12 hours. That and the amount of time I would spend physically organizing, revising, rewriting, and recycling my paper lists makes the shift to technology worth the risk for me. THOSE PANTS. I’m fairly certain those were worn during the last Winter Olympics by a team from somewhere in Eastern Europe. 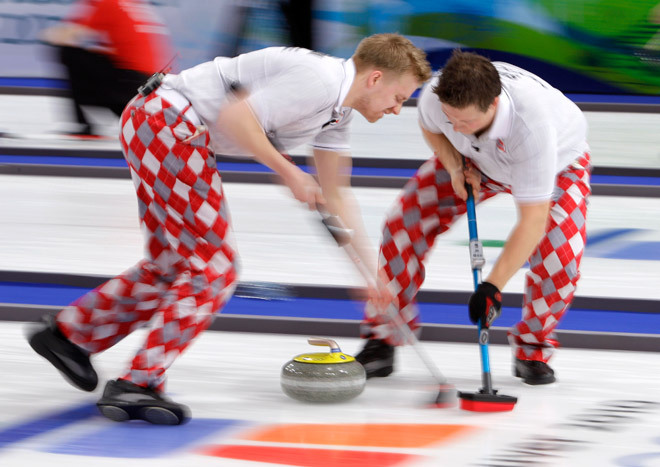 I remember being mesmerized by harlequin patterned pants during the curling event, and when I did a Google image search for curling, there were THOSE PANTS right on the first page of results. Hilarious. Well, I’ll leave the technology to you and take my hat off (this is me, taking my hat off). As to THOSE PANTS – what a tragic state of affairs for such an underwhelming sport. Very funny and isn’t that sad? 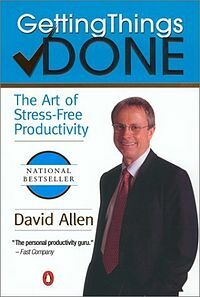 I’m going to have to see if the library has a copy of that book – I’m always a little leery of things that expect you to have hundreds of things on lists because of my delightful combination of ADHD and anxiety, but if it’s as “stress-free” as it claims, it might work. I am also a pen-and-paper sort of gal, because I’m the archetypal kinetic learner, and my ability to remember things I haven’t written down is truly abysmal. If having an exhaustive list is what works for you, though, paper might be more of a hassle than its worth. I’m getting a new MacBook Pro on Tuesday, so maybe I’ll have a few more insights once I’ve started browsing the App Store. 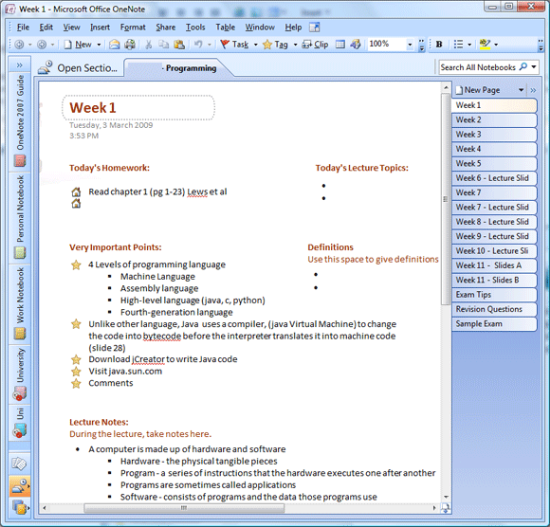 I’ve used Journler (which was freeware for 10.5) in much the same way you used OneNote. It’s much more like a journal (hence the name), but it had a few perks – audio and video recording into your notebook was pretty cool, I tend to talk things out with large wavy gestures. The idea with having the extensive lists is that you don’t want to be keeping track of anything inside your brain, which can be a very unreliable place to store information long term. If you can empty your brain of all the nagging thoughts of all the stuff you could/should/want to be doing then you can really focus on actually DOING those things instead of worrying about them. Then there’s a lot of stuff on helping you manage those huge to-do lists so that you’re not confronted with a giant wall of checklists and can focus on only the things you have the tools to do or are in the right environment to do at any given time. For example, if you are at home and aren’t heading out any time soon, you wouldn’t need your to-do list cluttered up with errands such as “deposit check at the bank” or “pick up milk” and can focus on more plausible activities like “do laundry” or “knit a swatch for socks”. My only caveat for the anxiety-impaired is that I had A REALLY hard time with the initial set-up. 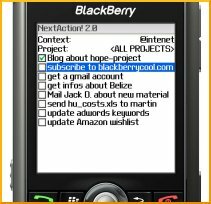 In the book he recommends collecting all of your action items in one go – over a weekend or something – and he’s really pushy about it, but with the paralyzing anxiety I get sometimes when confronted with massive projects, it was very difficult to stay focused for more than a few hours at a time. I imagine ADHD may pose a similar problem. You can definitely give it a try, but if you’re having trouble staying on task for the whole set-up, then ignore that part. Learn how the system works and set it up at your own pace. The book is geared towards CEOs and the like too, so unless that’s you, it’s not like a whole company is going to collapse if you happen to forget about that one very important email while you’re still working on implementing the system. I LIVE for putting checkmarks in boxes!!! And I wasn’t nearly this organized in college, though I probably would have gotten a lot more stuff done if I had been. Oooo, thanks for the tip, I’ll check it out! 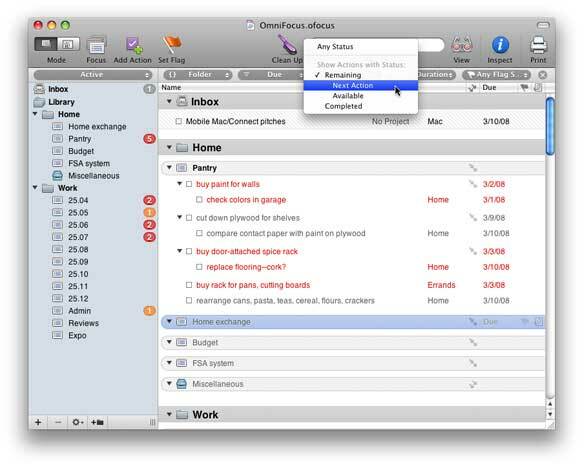 Toodledo is a pretty nice service, inexpensive for the Pro version with subtasks, and you can turn certain fields on or off in preferences as you intend to use them. It’s web-based but there are a lot of sync tools on a variety of platforms that will synchronize with it. They have a list on their site. 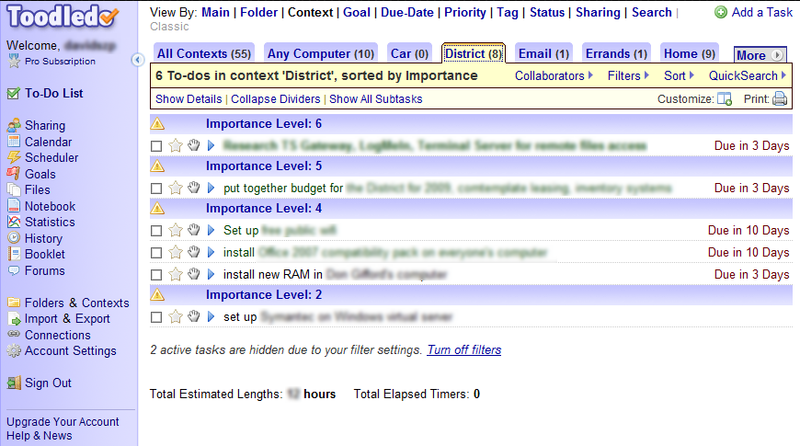 And a forum with a lot of folks discussing how they use it (many for GTD). 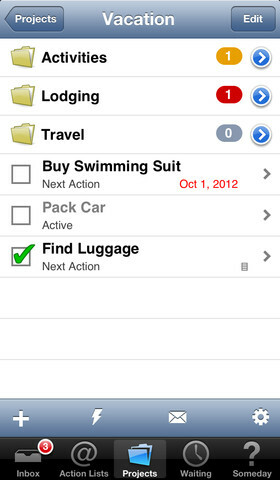 I personally like both the Toodledo iPhone app and Appigo’s Todo iPhone app, both of which sync with the Toodledo website. The Appigo app has a lot of repeat/copy/paste/duplicate options that are pretty advanced and uses subtasks for Projects. Toodledo mimics the website more closely but is pretty feature complete (and the website is quite powerful). But there are certainly alternate options out there. 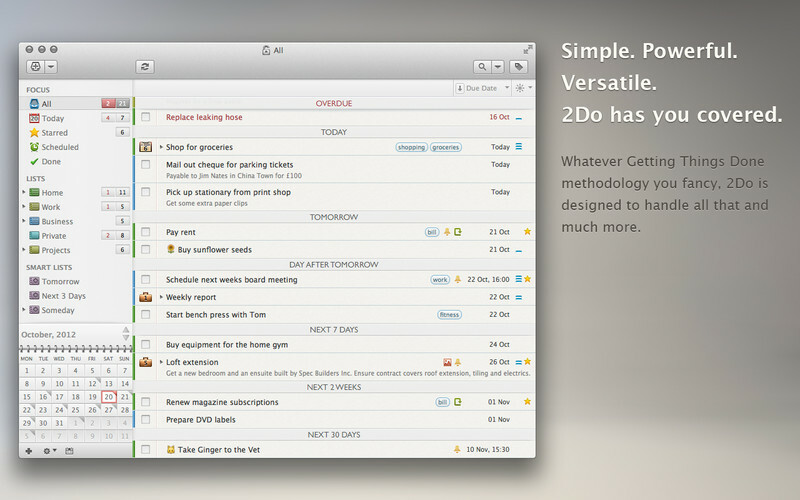 I’m more of a Windows guy but I’ve heard good things about OmniFocus. I like to sync though! Thanks! I would have used a screenshot of my own, but hadn’t figured out how to do that when I wrote the post!